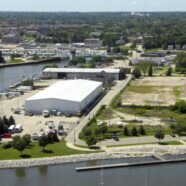 Major developer in the Milwaukee Bucks arena project secures option for Racine Harborside | Vandewalle & Associates, Inc.
EXCERPTS FROM JOURNALTIMES.COM: Mayor Cory Mason and Kevin Newell, President of Royal Capital Group, announced they have reached an agreement to allow Royal Capital to redevelop the former Walker Manufacturing site. The long-vacant Harborside is one of the city’s most desirable development sites with its nearness to, and view of, the lake. Founded by Newell, Royal Capital is dedicated to a strategy of urban development. With a focus on multifamily and multifamily mixed-use real estate developments, Royal Capital has made significant investment in the Wisconsin market. The Milwaukee Bucks also selected Royal Capital for the mixed-use housing and retail development that is part of the $1 billon downtown Milwaukee entertainment district, which includes Fiserv Forum, which opened in late summer. In mid-May the developer broke ground at the site of the future luxury lofts, Five Fifty Ultra Lofts, at 550 W. Juneau Ave. Since 2012, Royal Capital has performed as the primary developer and owner on more than $175 million in total investment.